At least since 570-550 BCE, twenty years that saw the birth of Pythagoras, Siddhārtha Gautama, Lao-Tsu, and Kong Qiu, there have been many great observers of humanity, who have named a reality that has had a major influence on society for hundreds to thousands of years. These philosophers were all great systems thinkers, asking the big questions of human existence and developing whole systems to understand, live by, and live within these pictures of reality. In designing these whole systems, with stocks, flows, information, and connections amongst them all, these philosophers, dating back at least 2,550 years have been master systems thinkers. Systems thinking is not new, but it is complex, and the few people who have had disproportionately huge influences on how the rest of us live our lives, embraced this complexity and designed whole systems that addressed all four questions at the same time. Pythagoras influenced western thought through Socrates, Plato, and Aristotle. Siddhārtha Gautama created Buddhism. Loa-Tsu delineated Taoism. Kong Qiu described Confucianism. A pretty impactful twenty-year period, in the beginning of at least 2,550 years of systems thinking. It is our turn to take the next step, to take on the design of the whole like they did so many years ago. EXECUTIVE SUMMARY. The challenge is always there. Our experience tells us that our current reality is not working. It is not achieving the outcomes our deeper values tell us it should. While we know that, in some way or another, we have agreed to the system that we have today, it is hard to see what will fundamentally change it. This is true for our experience of health care, education, work, money, environment–many of the large systems that we live in and that directly influence our lives every day. We therefore live with the questions of how can these systems evolve, how can we accelerate and scale that evolution? Fortunately, many people are trying to figure this out. And they have come up with many frameworks and processes that seem to work. To find one that works for you, I suggest two guiding principles: SCALE and CRISP. One principle for the what and one for the how. SCALE. The SCALE principle shows what the process needs to help you do. CRISP. The CRISP principle shows how it needs to do it. THE WHAT — What does the process you use to change large systems need to enable you to do? Scale. SCALE stands for strategic clarity to accelerate large-system evolution. Strategic Clarity — To have strategic clarity is to understand what the system is and how to move it, and how to communicate that understanding. What is. You need to understand what system you actually have. Approaches to describing the system follow 4 basic steps. First, they start by defining the system of interest, which is bounded by the dynamics generating the experience you are having. Second, they then take a macro-systems look to understand how the dynamics of the relevant parts generate the experience. The method guides you to see which experience, behavior over time, parts, and dynamics are relevant. Third, the approach then takes a micro-systems perspective to understand how each relevant stakeholder in the system makes sense out of the world, from their own perspective. Fourth, the approach then provides a meso-systems perspective to show how the micro perspectives interact to generate the macro perspective, and how changes in the micro-level perspectives or meso-level interactions can generate a different macro-level behavior. These four basic steps describe the system you actually have–what is. It might also help you to think of the system as an agreements field, a field of agreements we have consciously chosen and unconsciously accepted that determines our interactions, and the subsequent experiences and outcomes. Barriers to understanding what is. Exhaustive research over the past 70 years has proven that we humans are strong in knowing what outcomes we want and what we experience, and we are weak in understanding the systems and dynamics that generate those experiences and outcomes. Popularized in the past decade through behavioral economics, cognitive psychology, and the decision sciences, this scientific research shows that people tend to be quite poor processors of the types of complexity required for understanding systems. This research has also found stellar examples of where people are able to overcome these barriers. Three basic barriers to understand how to SCALE and methods for overcoming them include finding a deeper share purpose, seeing each perspective and its contribution, and holding it all together. Defining a deeper shared purpose–people come together to achieve a deeper purpose that they cannot achieve on their own. While many say they have a shared purpose, they do not. 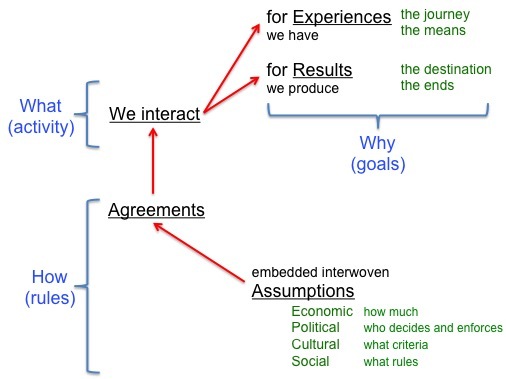 The approach should clarify what this is for the group, usually through inquiry, asking people why they care about the experiences and outcomes in the first place. Seeing each perspective–most people think two things. (1) They know what everyone else is thinking, or should be thinking, about any given topic, and (2) nobody else understands the richness of what they are thinking. And, if I don’t know what I think myself, until I ask myself, until I think about it, how can anyone else know what I think? Since most people do this, we all have mistaken pictures in our heads of other people’s realities. The amazing technological breakthrough to crush this ubiquitous phenomenon? The question. Ask. Inquiry-based approaches ask each perspective to describe their reality and then provide some form for validating it–confirming that the picture describes their reality, as they perceive it. Holding it all together–most people are not able to hold more than a couple of moving thoughts in their head at a time. Many graphically oriented processes, as described by the Strategic Clarity steps above, support people in building up a systemic understanding piece by piece, putting all of the pieces together graphically, so that they can all be held in the same space together. Strategic decision making. Once you overcome the barriers to strategic clarity, you have an understanding of what the system is. The approach now guides you to decide (1) where to support what exists, and (2) where to start what does not exist. Most of the existing parts of the system need to continue doing what they are doing–they are the basic infrastructure of the whole system–and some new things need to start, to shift the behavior of the whole system. Support for on-going activities and initiation of new activities both require a process for all of the relevant stakeholders to decide how they will take on their respective roles. Accelerating large-system evolution. With this strategic clarity, the approaches now focus on how to accelerate the evolution of the large system. Leading approaches draw from rigorous methodologies for collaborative tangibilization. Collaboration. To achieve the outcomes and experiences we all want, the approach is designed to unite us in going through a process to see what is, overcome the barriers, and achieve what we want for each of us and the whole. Supported by the technical rigor of the strategic clarity steps described above, people are able to ask of each other, in these approaches, what do we know? This is where human experience, intuition, and reflection excel. Collaborative approaches interweave processes for accessing the individual and collective wisdom and the knowledge gained from the strategic clarity synthesis. Tangibilization. To tangibilize is to make tangible, to see a possibility, to see a pathway to manifest that possibility, to see an outcome along that pathway, and to adjust once one has witnessed what tangibilizes in the process. This is evolution–learning along the way. It is about how to see what we want, a pathway to that outcome, while learning and adjusting as we evolve towards that outcome. Tangibilization approaches build in evolutionary learning into the process, witnessing at each step along the way, what is being seen in possibilities, pathways, and outcomes, evolving as those in the system learn. This is what we thought might happen, this is how we chose to test it, and this is what we learned, so now we will adjust what we think might happen. Over and over again, by design. The approach you take on should guide you to greater (1) strategic clarity and (2) accelerating large-system evolution. For an example of a strategic systems-decision synthesis process my colleagues and I have developed in over a hundred change efforts over the past two dozen years, see Strategic Clarity 2.0. THE HOW — How do the framework and process help you get SCALE? CRISP stands for comprehensive, rigorous, integrative, simple, and purposeful. As I did elsewhere, here I present the five CRISP criteria in a slightly different order. Purposeful — The purposeful criterion of CRISP requires that the strategic process be clear why we are doing this process–the organizing essence of what we are trying to realize together. This is also known as the essential property of the system–the reason for which it exists, for which it self-organizes. Comprehensive — The comprehensive criterion of CRISP requires that the strategic process provide a clear understanding of the boundaries of what is included as relevant and what is not included. Integrative — The integrative criterion of CRISP requires that the strategic process make explicit the relationships among the different dimensions, perspectives, elements, and processes. Rigorous — The rigorous criterion of CRISP requires that the strategic process be observable in reality, and reproducible. Simple — The simple criterion of CRISP requires that the strategic process be simple enough to be understood. This means that it must align with the rich complexity the human being is capable of understanding, not under or overwhelming them by dumbing down, oversimplifying, or overcomplicating the strategic process. The CRISP criteria assess the degree to which a strategic framework and process support you, the strategist, in understanding what the system intends to achieve and how it works. As you face daunting challenges, the SCALE and CRISP principles can guide your search for practitioners who provide large-scale-change frameworks and processes that can work with you to achieve the experiences and outcomes you believe are possible. “The most important implication[s] of the complexity of social-environmental systems is that you can’t do just one thing (p 63) […and] fitting the pieces together..requires an ability to understand how changes in one..asset..are likely to interact with the other assets…Doing this perfectly is not within our reach. But the revolutionary advances of the last decades understanding the dynamics of social-environmental systems provide a solid foundation on which to do it better” (p 51), according to Stanford’s Professor Matson, Harvard’s Clark, and UC Boulder’s Andersson in their recent framing of the emerging science and practices of social-environmental system resilience, in their book Pursuing Sustainability: A Guide to the Science and Practice (2016 Princeton Univ Press). To do more than “merely one thing” is to realize that everything is connected to something else, and that each of those “something elses” belongs to someone, someone who makes decisions about it. This level of understanding of how parts of the system interact, and how local decision structures influence them focuses on systemic decision structures. While the complexity of dealing with many moving parts, which are each influenced by multiple, different stakeholders, can seem overwhelming at first glance, many of us in the fields of decision and systems sciences have spent many years finding efficient ways to integrate the best of human understanding and wisdom with robust technologies, increasing the strategic clarity a group of individuals can achieve together. You can find many examples of strategic systems mappings of large-scale, complex systemic decision structures (here), as well as examples of groups mapping the underlying systemic agreement structures that influence the decisions made in the system (here). “Without an integrated appreciation and understanding of the social-environmental systems in which decisions are being made, unintended and negative consequences will too often result” (p 53). I know what I know. Right? Two authors I have been reading summarize research showing that we typically are not very good at knowing what we know now or recalling what we think we knew before. In his 1976 classic Perception and Misperception in International Politics, Columbia University professor Robert Jervis summarizes research that shows, “People often not only have a limited understanding of the workings of others’ arguments, they also do not know the structure of their own belief systems—what values are most important, how some beliefs are derived from others, and what evidence would contradict their views. Particularly dangerous is the tendency to take the most important questions for granted…This often involves..failing to scrutinize basic assumptions” (410-411). Highlighting a vast amount of recent research into the neuroscience of memory in his 2015 book The Brain, Stanford University professor David Eagleman writes, “Although we don’t always realize it, the memory is not as rich as you might have expected…The enemy..isn’t time; it’s other memories. Each new event needs to establish new relationships among a finite number of neurons. The surprise is that a faded memory doesn’s seem faded to you…Our past is not a faithful record. Instead it’s a reconstruction” (23-26). “Our picture of the external world isn’t necessarily an accurate representation. Our perception of reality has less to do with what’s happening out there, and more to do with what’s happening inside our brain” (38). If we are not good at knowing what we know or remembering accurately, then what can we do? These same lines of research highlight two human strengths: (1) our partial perspectives and (2) our error-correcting ability to calibrate. Our partial perspectives. We each perceive a rich world of sensations, inputs that we each are uniquely able to perceive and process. Combining a set of rich perspectives different individuals have about an experience can lead to a more nuanced, multi-dimensional understanding of a given phenomenon. This integrated set can then be tested against evidence: how the system actually behaves. Systemic, multi-stakeholder processes, like the ones we have tested and developed, at the Institute for Strategic Clarity, are one method for capturing, integrating, and validating this kind of richness. Our error-correcting ability to calibrate. Our brains seem to focus on correcting errors in the mental representation it already has of the world. The brain is calibrating. “Instead of using your senses to constantly rebuild your reality from scratch every moment, you’re compaing sensory information with a model the brain has already constructed: updating it, refining it, correcting it” (53 The Brain). ”The brain generates its own reality, even before it receives information coming in from the eyes and the other senses…(For example, the) thalamus simply reports on differences between what the eyes are reporting, and what the brain’s internal model has predicted…what gets sent back to the visual cortex is what fell short in the expectation” (51-52 The Brain). This act of calibration is a strength. Using evidence-based mapping, we can see what actually exists more rigorously and use that mapping to calibrate our individual mental representations, the mental models we use all day long to make decisions. To apply these concepts of partial perspectives, weak memory accuracy, and calibration to complex social issues like human agreements, we need rigorous frameworks for integrating and validating what we know. 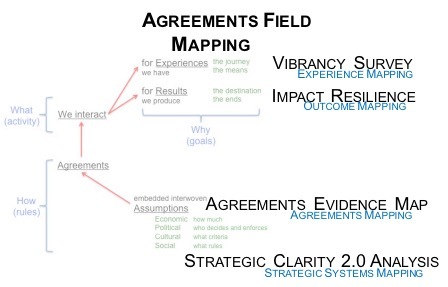 Especially since we also know that human agreements can be very hard to see, tools like Agreements Evidence Mapping are ever more critical for (1) capturing and validating partial perspectives, (2) integrating them into one whole, strategic representation that can be validated, around (3) often hidden agreements we have unconsciously accepted, that (4) we agree to shift. Maybe I do not know what I know, most of the time, but I can. A common object-ive is completely subject-ive. My colleagues and I find that most people who tell us that, in their group, they have a common objective they are all working towards are actually working at cross purposes, at best. What most people call a common object-ive is completely subjective–they are actually working on their own subjective understanding of what the means and ends are. This common object-ive is not a deeper shared purpose, and here is why the difference between a common object-ive and a deeper shared purpose matters. To co-host collaboration, we start with uncovering, understanding, and naming the deeper shared purpose that pulls a group of people together and guides their interactions. We are trying to find out why these people come together to work together towards something they hold together. A common object-ive does not answer this question. When most people say they have a common objective, they are actually saying that they are each working on something that influences the same distant object. Group A works on building schools in poor regions, so that kids can go to school. Group B trains bilingual teachers, so that kids from different cultures can have access to a basic education. Group C provides free lunches as incentive to parents to let their kids go to school. All three groups are working on a common object-ive of giving kids an education. When the leaders of Groups A, B, and C came together, they told us that they were clearly working on the same object-ive, educating children. And, it was clear that they were not working on a shared deeper purpose, as they were not working on these three seemingly interrelated dimensions of access to education together, as they were often not even working in the same regions of the country. Yes, there were schools, with no teachers or students. Or yes there were teachers, with no schools or students. And, there were students, with no schools or teachers. The three groups were not working on the same, deeper, shared purpose. Working apart, from different perspectives, in different areas, towards a common object. Seeing parts and a common object does not make a system of interrelated parts towards a common purpose. Moving different parts at a common object is not leveraging a system of interrelated parts towards a shift in systemic behavior. By a deeper shared purpose, we mean working together towards leveraging a system of interrelated parts to shift a systemic behavior–showing up in the same place, in a coordinated fashion, to provide schools and teachers and students with access to an education. This coordination requires a different kind of theory of change, one that we have called a theory of impact resilience. How do you know whether you have (1) a common object-ive or (2) a deeper shared purpose? I suggest you immediately have three pieces of evidence you can use to triangulate to determine which you have. Language. Start with the language of what the groups holds to be common. If it is a common object-ive, it might sound like, “We work on X to get Y–building schools to educate kids. We do W to get Z–developing bi-lingual pedagogy to give bi-lingual children access to schooling.” Each is working on a means to what looks like a common object. No mention of working in a coordinated way with other means to that same ends, as a system. For similar examples, see our Guatemala project. If it is a deeper shared purpose, it might sound like, “We are working with the groups that develop all of the required dimensions of the educational system for kids in this region, all of which are necessary to provide equitable access. We are trying to figure out together how to shift our work, together, to get a different outcome for these children, in the same place at the same time.” For similar examples, see our Guatemala project. Experience. Describe what it is like to work within this group. If it is a common object-ive, we find that most groups describe an experience of competition amongst the different members trying to achieve the common object-ive or low levels of co-operation amongst the members–often competing to get funding from the same sources. These often feel like the inner to middle circle of the vibrancy experience, tiring and an endless struggle. If it is a deeper shared purpose, we find groups usually describing an experience of collaboration amongst the different members, inviting and inspiring each member to make their best unique contribution. This is often described as the outer circle of the vibrancy experience, invigorating and life-giving. Expectations. Observe what the group and the members of the group expect of each other’s contributions to the group. If it is a common object-ive, we find that most groups either (a) do not have clear expectations of what you could or should contribute, or (b) see the contributions as interchangeable–if you won’t do it, we can find someone else who can. If it is a deeper shared purpose, we see that most groups are very clear on why you are specifically invited to make your unique contribution to the group–you are needed and your contribution is unique and critical–you are not interchangeable with anyone else. 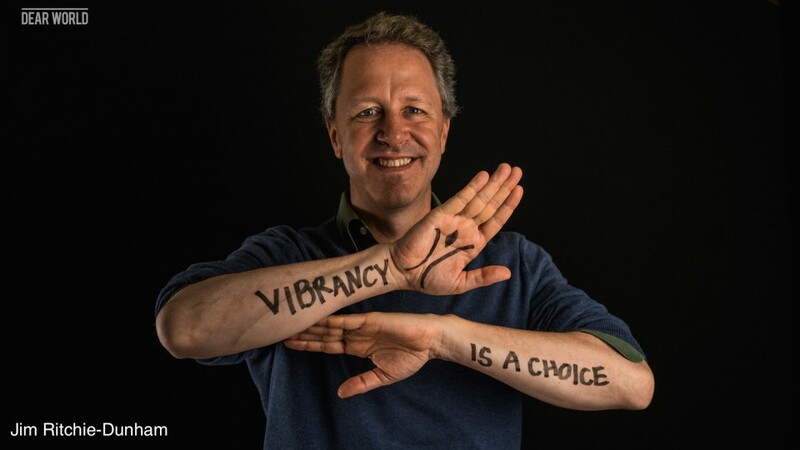 As you look at your own group’s “common goal,” here are three guiding questions, which frame the process we call the harmonic vibrancy move process. Do you have a shared unifying objective for the whole system? We call this the deeper shared purpose. Do you have a shared unified theory of how all the parts fit together and influence the dynamics of the whole and how to shift the dynamics of the whole? We call this the systemic view of why the different voices are required. Do you have a unified theory of intervention for each perspective’s best contribution to collaboratively and collectively shifting that behavior efficiently? We called this systemic leverage. More and more people are looking to large-scale social change processes to leverage their impact around very complex issues. From poverty, health, education, epidemics, and inequity to water, air, green building, and renewable energy. Scaling collective impact is everywhere. I have been looking at, and engaging with many of these efforts, for two decades now. In trying to figure out how to support large-scale change, many groups are trying to become evermore strategic. As a big proponent of strategic clarity, I encourage the strategic dialog, and I encourage pathways that will support a group in getting to greater clarity about what they can do together and what will work. In their strategic development processes, many groups now focus on developing a “theory of change.” I agree that it is far easier to learn and refine a strategy when you have a theory of what you are going to do. And, I see some inherent difficulties in the way many groups currently frame their theory of change. Hopefully a brief picture will clarify what I see as the intention and a better answer. To start with, I see that most social-change efforts grow up around an effort that initially worked. There was an intervention and there was an impact. While not quite sure how it worked, the impact is there. We created a kitchen, and more people were fed tonight. In this experience, there is typically an implicit theory of “it just works.” We do this, and we see the impact. Usually the distance in time and space between the intervention and the impact is very low or immediate. We can see it directly. I see this as the lower-left quadrant in the 2×2 matrix below, low clarity of causality with a linear direction of causality. This success often leads to the desire to scale the work, to get much greater impact. To scale up the intervention often requires investment of greater capital. Investors of this greater capital usually want to see a greater understanding of how the intervention will lead to the means that will drive the impact. Greater investment wants to lower the risk of not understanding. They want to see a theory of “change,” a “comprehensive description and illustration of how and why a desired change is expected to happen in a particular context.” As far as I can tell, from what I see in foundation, nonprofit, and network reports and in my own conversations, most of these theories of change provide linear descriptions of how an intervention will lead to some specific means of change in a specific context that will lead to the desired social impact. A to B to C. I see this as the lower-right quadrant in the 2×2 matrix above, high clarity of causality with a linear direction of causality. While this greater clarity of causality makes it much easier for the intervention leaders and the funders to test whether the intervention leads to the expected means and impacts, this linear approach to complex social issues leaves out a critical reality–feedback. If the decisions you make today affect the decisions you can make tomorrow, then there is feedback. A to C to A. If the decisions you make influence others who then influence you, there is feedback. All complex social issues contain impacts of any intervention on other stakeholders and on resources that influence the ability to continue to intervene in the future. They all have feedback. As the complexity of an intervention increases, like trying to feed a whole city through a large network of kitchens, most efforts seem to try to continue what they were doing before with just a lot more resources. They use the same logic, on a bigger scale. Lots of intervention, mixed with lots of magic, leads to lots of impact; so goes the “theory of I think.” I think that if we just … I see this as the upper-left quadrant in the 2×2 matrix above, low clarity of causality with a feedback direction of causality. While the situation might be much more complex, with many more stakeholders and resources involved, I think if we just do a lot more, we will get much more impact. It rarely works, often because of the unseen feedback effects, which is why social impact investors have moved more and more towards wanting to see something that demonstrates a greater clarity of causality. Right now the best-in-class practice seems to be the “theory of change” I mentioned earlier. To complete the high-level overview a theory of change provides, of the preconditions, pathways, and interventions needed to achieve the desired impact, many groups develop a complementary logic model and evaluation plan. The logic model lays out a linear model of how the planned work with resource inputs and activities leads to the suggested outputs, outcomes, and eventual impact. A very clean and relatively simple way to explain how to implement the theory of change. The evaluation plan then provides measures to test the hypotheses for the different elements: the resource inputs; the activities; the outputs; the outcomes; and the impacts. The strategy process then pulls together the theory of change, the logic model, and the evaluation plan, in a crisp, linear mapping. Now, if (1) the social issues we face require much greater investment, influencing a greater number of stakeholders, in contexts of much greater feedback, and (2) a linear strategy based on a theory of change, logic model, and evaluation plan falls short of dealing with the feedback complexity, what do I suggest? A “theory of impact resilience.” While a theory of change focuses on how a change in an intervention will lead to a change in specific means, which will drive change in a specific social impact–in a linear model–a theory of impact resilience looks at the system of causes, effects, feedback, and stakeholders that lead some interventions to generate a much more resilient system that delivers much greater, sustained impact. I see this as the upper-right quadrant in the 2×2 matrix above, high clarity of causality with a feedback direction of causality. Over the past twenty years, with many colleagues around the globe, we have developed systems-based strategic approaches to engaging multiple stakeholders around complex social issues. There is now a whole industry of such approaches. It turns out that it is not hard to bring together many people who are passionate about any specific social issue, find out how they each contribute different elements of the solution, and how they can work together to change the behavior of the whole system. In the past decade alone, people have applied this kind of approach successfully on six continents to hundreds of important, complex social issues. It only takes the will to do it, a little know-how and a few elapsed months of work. Not decades. So, while I applaud the desire of social impact investors to dramatically increase the clarity of causality between an intervention and a social impact, it is time that we move beyond “keep it simple,” linear models of causality to incorporate multi-stakeholder, feedback models of causality. A theory of impact resilience, based on systemic, strategic approaches suggests how. It provides a systemic theory, it lays out the systemic logic of how the interventions lead to shifts in the system of stakeholder responses and subsequent systemic impacts, and it provides an impact resilience scorecard of the systemic measures that indicate how the interventions are leading to systemic shifts, to greater resilience, and to scaling of the impacts.